The Internet is becoming a more and more dangerous place to be, due in no small part to the inherent security risks posed by viruses and spyware. Additionally, applications that access the Internet as part of their normal operations may have errors in their code that allows hackers to launch attacks against the computer on which those applications are running. The safety and integrity of digital assets is further compromised by the fast-growing threat of cybercrooks who devise and implement large-scale hoaxes such as phishing and ID theft. In the light of all this, it's clear that users need a reliable and secure web browser between them and the Internet, which will be free of these problems and won't let harmful content invade the computer. The web browser industry continues to be dominated by the Windows-bundled Internet Explorer, with an 85% market share, but in recent years a new breed of free, more functional and resilient browsers has appeared - the most popular being Mozilla/Firefox and Opera. All have received serious security upgrades to help protect against recent scares and safeguard users online. Internet Explorer is at version 6.0, essentially the same product that was included with Windows XP in 2001. Eighteen months ago, the release of Windows XP Service Pack 2 substantially increased IE safety; however, it did not eliminate many of the loopholes exploited by hostile program code. At present, Firefox is at version 1.5, but its very different development history (see next section) means that it can be considered at a similar level of maturity as Internet Explorer. Currently, Microsoft is preparing its next-generation browser, Internet Explorer 7.0, which it plans to introduce sometime during the first half of 2006. The company has stated that it intends to make the browser stronger and more secure to help protect its users against the many problems that have dogged the software over the years. We, along with Internet users everywhere, await the final results with interest. In the meantime, we decided to undertake our own security evaluation of both IE 7 (beta) and its closest rival, Firefox 1.5. Internet Explorer is a proprietary graphical web browser developed by Microsoft. In 1995, the company licensed the commercial version of Internet Explorer 3.0 from Spyglass Mosaic and integrated the program into its Windows 95 OSR1 edition. Later, it included IE4 as the default browser in Windows 98 - a move which continues to raise many antitrust questions. Firefox is an open-source browser developed by the Mozilla Foundation; anyone who is proficient enough can collaborate in writing and improving its program code. Mozilla is known for its stringent approach to security, promising a bounty of several thousand dollars for any major vulnerability found in the product. Firefox allows you to create multiple profiles for saving your bookmarks, user names and extensions. To manage those profiles, it is helpful to locate your Firefox profile folder on your computer. Once you locate the profile folder, you will be able to backup your profiles or move them to a new location. Click 'Start' from the desktop and then choose 'Run' from the menu. In the 'Open' line, type '%AppData%' (without the quotes) and press the 'OK' button. This will automatically open the 'Application Data' folder on your computer. Browse through the list of folders until you find the 'Mozilla' folder. Double-click the folder. Find the 'Firefox' folder and double-click to open the folder. Locate the 'Profiles' folder and double-click it as well. Find the 'xxxxxxxx.default' folder and open it up. The Xs represent 8 random letters and numbers that will be unique to your computer. Locate the profiles found in this folder. Mozilla Firefox is an Internet browser known for its speed and customization options. In December 2009, Mozilla Firefox became the most popular web browser, with a global market percentage of 21.93 percent. While many people enjoy the benefits of Mozilla Firefox, some users have experienced a pesky Firefox.exe error. Fortunately, fixing this error is relatively easy. Click on "Uninstall a Program." Scroll down the list of programs and click on "Mozilla Firefox." Click on "Uninstall" and then click "OK."
Download the latest version of Mozilla Firefox at the Mozilla Firefox home page. The link for this page can be found in this article's Resources segment. Firefox.exe errors are often the result of a bad installation. Moreover, Mozilla Firefox continually updates its Web browser to combat errors. Therefore, reinstalling Mozilla Firefox should fix the Firefox.exe errors. If it does not, continue to the next step. How to Increase Firewall Protection ? With the constant threat of Internet hackers and identity thieves it is vital that your computer is fully protected and always updated for the latest viruses and malware. The Windows firewall, a default with most PCs, is a powerful anti-virus tool that can be configured to increase your computer's protection. Navigate to your Computer's Control Panel located in the Start Menu. Double-click on the "Windows Firewall" icon to open a new window. The Windows Firewall icon is represented by the image of a brick wall with the planet earth behind it. Ensure that the Windows Firewall is switched on. If your firewall is not switched on your computer is susceptible to incoming viruses, Trojan horses and malicious files. Click the "On (recommended)" button to turn on your firewall. Click the "Exceptions" tab at the top of the Windows Firewall window. You are still allowing certain programs and applications to download and transfer packages through your PC although your firewall is running. By altering the Exceptions of your firewall you can increase the protection of your PC. Clicking on the "Exceptions" tab opens a new window section. Un-tick some of the programs that are more likely to contain or traffic malicious files. For example, P2P file-sharing programs such as Limewire, Ares and UTorrent are not 100 per cent regulated or checked for viruses. Update your firewall with a Windows Service Pack. Windows is constantly updating the firewall software of its Operating Systems and this means that any new or previously-unknown malware will now be recognized and prevented from accessing your PC. Your computer will let you know and warn you when these new malicious files are accessing your computer. How to Import Bookmarks Into Firefox ? Importing bookmarks from another computer or other web browser into Firefox is easy. With just a few clicks, your bookmarks will be saved into your Mozilla Firefox browser. Open up a Firefox window. Click on the "Bookmarks" menu and select "Manage Bookmarks." If you are using Firefox 3.6.2, then you need to click on "Organize Bookmarks..."
In the window that pops up click on the "File" menu and select "Import." In case of Firefox 3.6.2, click on "Import and Backup" just above the list. Then click on the "Import HTML" option from the drop-down list. A new window comes up. Select the "Microsoft Internet Explorer" option if you are importing favorites from Internet Explorer on the same computer. Then click next. If you are importing from a file of saved bookmarks or favorites choose "From File" and click next. Select the file in the open window that pops up and then click "Open" if you are importing from a file. Firefox will do the rest for you. If importing from Internet Explorer, just click "Finished" when it's done. Many people do not realize that they have a choice when it comes to choosing an Internet browser, but they do. The fact is that the best web browser is probably not the one that came pre-installed on your PC. In this article, we will tell you why. When you buy a laptop computer, you typically receive a lot of built-in software. The first piece of software that you see on any new machine is the operating system itself. For most of you, this will be either Windows XP, Windows Vista, or Windows 7, the latest version of the Microsoft operating system. This operating system software is “the director” in your computer, allowing everything else to function properly. As you will note, all of the operating systems listed above are made by Microsoft. So, what software do you use when you actually surf the Internet? Well, a large percentage of you use Microsoft Internet Explorer, which typically comes bundled with your computer. In fact, some competitors were using names like “monopoloy” when referring to how Microsoft bundles their other software to go with all new computers. Because it is the only immediately available Internet browser on many of the latest best selling laptops, many consumers do not even realize that they have a choice. But when it comes to using a web browser to surf the Internet, there are choices beyond Microsoft’s Internet Explorer and you may find you prefer other browsers to the one pre-installed on your machine. In fact, the Internet Explorer that comes with your new top rated netbook has not been recognized as the market leader. Another product called Mozilla Firefox has. For those who know they have an option when it comes to a browser-based products, Mozilla Firefox has become the overwhelming choice because it simply performs better. What is the one thing that people crave most in a web browser? The answer is speed. In speed tests, Firefox has proven to be much faster than its Microsoft counterpart and this alone often convinces people to switch to Firefox. However, there are many things other than speed that people love about Firefox. You will hear a confusing term called extensibility, which is also loved by technical folks and end-users alike. This essentially means that you can easily add things to Firefox and tailor it to your needs. For example, I have a Spanish dictionary plug-in that I love. So, when it comes to the best web browser, the pre-installed one is not always the best. Give Mozilla Firefox a try and you may be in store for a very pleasant surprise. Have you been using Firefox for quite some time and lately noticed that it is running slow? The loading of pages takes longer than usual and sometimes it just hangs. You've checked your internet connection but there is nothing wrong there. Everything else works perfectly fine yet Firefox is still running slow. The problem here lies in your Windows registry. The registry is the central storage for all settings of your operating system and installed applications. It contains information that Windows continually references during operation. It is the heart and brain of your system that is why registry errors have a tremendous effect on your computer's operation including that of Firefox. Every time you open your browser, a record is logged in the registry. Over time, it will contain loads of Firefox related files and processes. Most of them become redundant and obsolete causing the registry to be congested thus the reason why Firefox is running slow. Windows doesn't automatically clean these invalid entries because there is no internal tool which does this task. In order to speed up your Firefox browser, you must first take all the junk from your registry. One way to do this is manually. If you are very sharp with computers then you can manually sift through the registry and get rid of the invalid and redundant browser related files. Others may find that reinstalling Windows can perform the trick by giving you a clean slate. But for the complete computer novice, I recommend getting a registry cleaner. With the right software you can scan your computer and speed up Firefox in minutes. Not only will you not have to ask why Firefox is slow, your entire system will be turbo charged. If you want a secure, stable and fast browser then you need to look no further than Firefox. Whether your new to Firefox or a current user looking for some tricks or tips you should find this article helpful. You can run Firefox browser alongside other browsers such as IE and Chrome, so you can keep your existing browsers while you take it for a test drive. You download Firefox by simply going to their website and downloading it and following the install instructions. When opening a new window, it is a good idea to use the 'tab' option as this will enable you to have many pages on one window, which is easier to navigate instead of having many windows. When you enter the URL of the site you wish to visit it is unnecessary to enter www. or http:// as just the name followed by.com or whatever else is the domain ending, e.g EzineArticles.com will suffice. Type about:config in the Firefox address bar. Press enter and then ok. Next type network.http in the Filter box the and double click network.http.pipelining, next double click again on network.http.proxy.pipelining. Then double click on network.http.pipelining and type 30 in the dialogue box and enter.. Find an empty spot in the configuration settings and right-click then select New- Integer. Here make the the new entry nglayout.initialpaint.delay and make it a value of number 0. Lastly click on x to exit Firefox. Your Firefox browser should now be faster at loading pages. I hope you have found the tips in this article beneficial. An industry standard graphics engine recently added to Mozilla's Firefox browser allows attackers to surreptitiously steal any image displayed on a Windows or Mac computer just by visiting a booby-trapped website, security researchers have warned. The vulnerability, reported Thursday by UK-based Context Information Security, is unique to Mozilla's implementation of the 3D-accelleration API known as WebGL, but researchers with the firm said it's related to serious design flaws in the cross-platform technology. 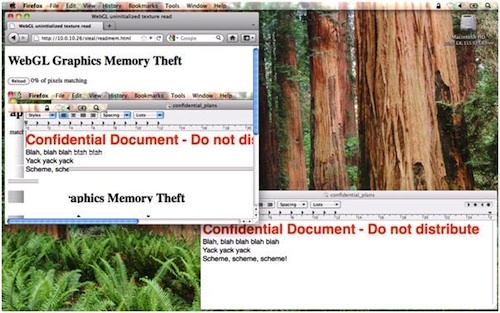 The report comes five weeks after Context first warned of data-theft and denial-of-service threats in WebGL, which is also built into Google Chrome and developer versions of Opera and Apple's Safari. Apple on Thursday announced that iPhones and iPads will offer limited support for the technology when iOS 5 is released later this year. The report, coincidentally or otherwise, came the same day researchers from Microsoft's Security Research Center published a brief analysis titled "WebGL Considered Harmful" that concurred that it suffers from a variety of weaknesses that will be hard to fix. "The security of WebGL as a whole depends on lower levels of the system, including OEM drivers, upholding security guarantees they never really need[ed] to worry about before," the Microsoft critique stated. "Attacks that may have previously resulted only in local elevation of privilege may now result in remote compromise. While it may be possible to mitigate these risks to some extent, the large attack surface exposed by WebGL remains a concern." Microsoft products that implemented WebGL would have a tough time passing the company's rigorous Security Development Lifecycle, the analysis added. Microsoft has instead relied on a home-grown technology known as Direct3D to make graphics faster in its applications. A Context representative said Microsoft didn't commission the Context report. A Microsoft spokeswoman declined to say if Microsoft provided any support. The Context researchers have developed a proof-of-concept exploit that allows an attacker to steal images displayed on computers that do nothing more than use a current version of Firefox on a WebGL-enabled machine to browse a site with a malicious payload. The attack works by "spraying" memory in the computer's graphics card to collect data that's already been processed. "The vulnerability we discovered enables any graphics image that has been displayed on the system to be stolen by an attacker by reading unitialised data from graphics memory," the Context report stated. "This is not limited to WebGL content but includes other web pages, a user's desktop and other applications." A video included with the report shows images from an encrypted session on LinkedIn.com being stolen from a computer running Apple's OS X. The exploit also works against PCs running Microsoft Windows. A spokeswoman for Mozilla said the vulnerability will be fixed with the introduction of Firefox 5, due next week. A statement issued by representatives of Khronos, the firm that acts as the gatekeeper for the WebGL standard, said that the threat "is due to a bug in Firefox's WebGL implementation, and cannot be generalized across other browsers' WebGL implementations." The Context report raised other concerns about the security and stability of WebGL, including the failure of both Firefox and Chrome to pass a suite of conformance tests that prove their implementations adhere to official specifications. "Between disparate platforms the browser must be exposing some aspect of the underlying graphics implementation to the web page for problems to arise, even if it is something trivial such as incorrect return values," the report concluded. The Context researchers also found problems in a previously-released extension designed to mitigate the effects of vulnerabilities that make it easy for websites to completely crash machines that have WebGL enabled. So far, only graphics cards made by NVidia support the GL_ARB_robustness extension, and even then it doesn't work on machines running Windows XP, the Context researchers claimed. Mozilla has responded with a forthcoming GL_ARB_robustness_2 extension, further calling into question the effectiveness of the current extension, they added. The Khronos spokesman's statement said: "All browser vendors are still working toward passing the WebGL conformance suite. Only once they have successfully done so can they claim support of Canvas.getContext("webgl") instead of Canvas.getContext("experimental-webgl")." The statement continued: "Browser vendors are still in the process of supporting the GL_ARB_robustness extension, so it is expected that the previously reported denial-of-service issues are still present. It is expected that the reported denial-of-service issues will be solved with the integration of this extension." A Google spokesman said that Chrome doesn't run WebGL on some system configurations when lower level stack issues are identified and that many parts of WebGL, including the GPU process, run in separate processes that are sandboxed in the browser to help prevent the kinds of attacks described by Context. Context researchers recommend users disable WebGL in both Firefox and Chrome, while the US Computer Emergency Readiness Team has suggested administrators review the Context findings and "update their systems as necessary to help mitigate the risks." The two reports from Context, and the responses from Khronos, strongly suggest that WebGL is still in its adolescence and will require a more work among browser makers and hardware manufacturers for it to become mature. Disabling WebGL is probably an overreaction. Then again, at this early stage, users who turn it off probably aren't missing much. For those who decide to forgo the benefits of WebGL, Context's report provides step-by-step instructions for turning off the graphics-acceleration interface in both Firefox and Chrome. If it says Microsoft Internet Explorer® then you have the browser that between 80% and 90% (depending on who you talk to) use. Mozilla Firefox 3.0, the resurgent browser developer has come of age with its latest offering. The new browser has been downloaded well over 8 million times in 24 hours as against the developer's target of 5 million and has entered the Guinness Book of World Records for maximum number of downloads in a single day of download history. There was overwhelming support, both from the United States and the Euro zone with downloads in excess of 2.5 million apiece. The response for the finished Mozilla browser is largely on account of meticulous care the foundation has taken in providing solutions to expert suggestions. The new version was delivered after three and half years of extensive research and development which included of six months of public testing. The highly mutated form of earlier versions of the browser is set to change the way users organize and search the sites, they frequent more often. Back in late 1990's, the Netscape, the first browser developer virtually lost out to Microsoft's Internet Explorer, but with the third avatar of Firefox, they are making an attempt to garner the past glory. After America Online took over Netscape, they created a non-profit Mozilla Foundation in 2003. 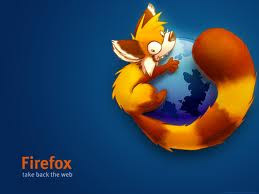 The first offering from them, the Firefox, itself was able to catch the imagination of the internet buffs. It is estimated, Firefox has 200 million users worldwide prior to the launch of the new version and the numbers are still growing rapidly. 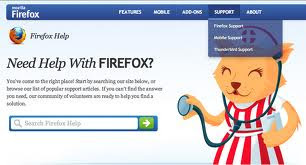 Millions of users had downloaded Firefox and started using the browser in lieu of the default browser Internet Explorer clearly indicates its user-friendliness and application. The new Firefox 3.0 browser is faster than Firefox 2.0. The latest versions of Internet Explorer, which has 75% share among the web users and other leading browser developers including Opera and Safari do not match the speed rendered by the latest Firefox version. Like its earlier version, this too has added security features to expunge any misuse. It has in-built features to instantly detect phishing and malware forays. Moreover, one's computer's resources are less drained while navigating on the internet with Firefox 3.0. Consequently, Microsoft also unveiled the public test version of the latest edition of Internet Explorer, version 8.0. So far Firefox 3.0 has no competitor in terms of effectiveness and efficiency to strike any comparison. But the fine tuned edition of Internet Explorer which is expected to be released by the end of this year may become a potential competitor in the e-space. It is learned that even Apple's Safari browser has shrugged off its previous image of providing surf solutions to its own devices, and would be extending its compatible browsing services to other devices as well. Stiff challenges in future is likely to improve the efficiency of browsers especially the subsequent versions of Firefox, which already offers exploring of multiple tabs or windows, complex pages and lots of embedded content without crashing. The exciting response on the download of new version, the most customizable browser ever to hit the net will certainly prompt the Mozilla Foundation to improve on.